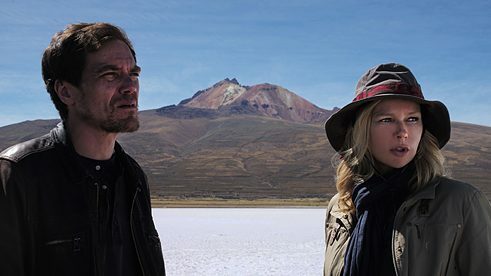 In ‘Salt and Fire’, two passionate figures come face to face: scientist Laura Sommerfeld (Veronica Ferres), who is sent to South America by the United Nations to investigate an ecological catastrophe; and corporate executive Matt Reilly (Michael Shannon), whose company is responsible for the situation. Their meeting is far from inevitable; however their obsession with their work would’ve made it feel otherwise, if an act of purposeful intervention didn’t specifically ensure that they cross paths. Alongside fellow experts Fabio Cavani (Gael García Bernal) and Arnold Meir (Volker Michalowski), Sommerfeld is kidnapped upon her arrival and kept by her counterpart, who initially dons a mask to conceal his identity. Eventually, he reveals his face, his lyrical musings on everything from anamorphic artwork to animals held accountable for their crimes, and — via a trip to a desert turned salt plain — his ultimate plan. 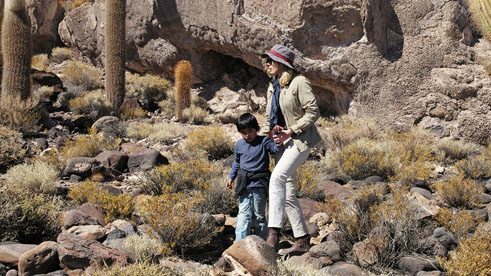 Their interactions make for intriguing viewing, though the bulk of Salt and Fire’s eco-disaster narrative proves interesting more than engaging. Marking his latest fictional effort, Werner Herzog’s feature suffers from stilted dialogue, tangential conversations that lead both everywhere and nowhere, plot threads and characters left hanging, and committed but constrained performances. In other words, many of the writer/director’s recognisable trademarks fail to set the screen ablaze in this adaptation of the story Aral by Tom Bissell, though his dedication to his particular style of filmmaking remains admirable as always. And yet, in a contrast not too dissimilar from the film’s title, some of his familiar obsessions also ensure that Salt and Fire retains attention. The film 'Salt and Fire' is laden with a general sense that the acclaimed filmmaker is considerably enamoured with his location | © Salt and Fire In a movie comprised of three distinctive acts, Herzog spends his first establishing the type of fervour he often displays himself when voicing and fronting his factual works. 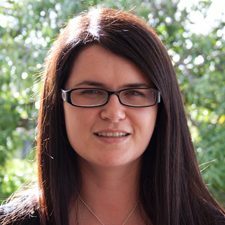 The decisive Sommerfeld itches to do her job, noticeably so, while her captor is just as determined to capitalise upon her eagerness. Next comes a prolonged and leisurely account of their back-and-forth banter, frequently phrased in ways reminiscent of Herzog’s own documentary narrations, illustrating the extent of Sommerfeld and Reilly’s passions, and — despite appearances to the contrary — their commonalities. Finally, the film tests Sommerfeld’s keenness to work and make a difference by stranding her within the very place she was enlisted to investigate. Combined, all three chapters paint a portrait of compulsion; combined with the dazzling setting of its final third, they demonstrate Herzog’s in action. Indeed, while much of Salt and Fire’s early segments appear to use Herzog’s particular quirks out of habit more than artistic intention, there’s no doubting his commitment to depicting obsession within his features — and pursuing it in their making. And, nowhere does his own fascination with and illustration of that subject manifest better than in his use of the feature’s instantly arresting landscape. In fact, the film is laden with a general sense that the acclaimed filmmaker is considerably more enamoured with his location than his tale or characters, something that proved true in his previous narrative outing, Queen of the Desert, too. That apparent affection for his backdrop offers a welcome and exciting spark that the rest of the movie lacks, with his passion keeping things bubbling when it starts to wonder. In Werner Herzog's film Sommerfeld (Veronica Ferres) is kidnapped upon her arrival and kept by her counterpart, who initially dons a mask to conceal his identity | © Salt and Fire Herzog’s fondness for these salty lands beneath a quietly rumbling volcano is completely understandable, of course — and his choice to use them as catalyst and a symbol as well. Extending as far as the eye can see, the Salar de Uyuni flats in Bolivia provide the kind of visually striking feature that a director could consider a blank canvas, the staging for a revelation, a story in their own right, the culmination of years of documenting the earth’s stunning sights, and the epitome of mankind’s search for meaning in this world. With the eye-catching plains helping to tie his narrative strands together somewhat, or at least ground them, Herzog evidently does. As he luxuriates over vistas that whisper hard truths about humanity without saying a word, to look at Salt and Fire’s later frames is to get lost in their majesty, to fall under their silently bewitching thrall, and to understand the burning desire that both drives the inimitable German filmmaker and consumes his on-screen work. 'Salt and Fire' screens at The Wrath and Reveries of Werner Herzog. Please see ‘related links’ in the right column for screening dates and tickets.